It’s very important news for the candidates from Tamil Nadu state who are seeking for the job vacancies from the government department. This is purely for the graduates who have the talent and interest to work with the Tamil Nadu police department can utilize this chance. 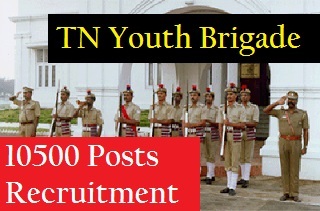 TNUSRB which is firmly known as Tamil Nadu police special youth brigade has uploaded the official recruitment advertisement on the online website. They also planned to fill the 10500 TN police vacancies through this recruitment portal. It is equally important for the interested and eligible candidates to apply for the posts before the deadline. Now the contenders who have the interest to apply for the posts should download and access the notification booklet to get the eligibility criteria details. Also, send your application forms with required document attachments. We also advise the candidates to submit the application forms along with the supporting stuff. The board also decided to conduct the selection process in various parts of the state. Name of the board: Tamil Nadu police special youth brigade. Name of the post: youth brigade. The contenders have to satisfy the eligibility criteria framed by the recruitment board to participate in the selection process. Here we have listed the essential details to apply for the recruitment process. The aspirants should have minimum educational qualification of 10th or any other equivalent educational details from the recognized board or university. The aspirants should be aged from 18 years to 24 years at the time of recruitment process. The candidates who satisfy the age limit will be allowed to submit the application form. You can also check the age relaxation detail as well from the official portal. The candidates who have applied via online portal are instructed to attend the selection process organized by the authority. The selection process will include written test and interview process and physical test. · Firstly visit the official portal with the help of online link. · Then search for the registration form link and open it. · Enter the details to fill the application form and attach the needed documents. · Now check the form once and submit it via online mode. · Keep a copy of the application form for further use.